Gorgeous, Brand New ,Never Lived 4 Bdrm Home With 4 Washrooms (2690 Sq Ft ) Separate Living Area And Family Room. Laminates Floors On The Main Level, Natural Wood Kitchen W/Centre Island, Breakfast Bar, 9' Ceilings, Dbl Door Entry Into A Grand Foyer. Master Suite W/5 Pc Ensuite W/Soaker Tub, Separate Shower, Spacious Walk-In Closet In Master Bedroom & Oak Wood Staircase. Unspoiled Lookout Basement Ready For Your Personal Touches. No Side Walk. Laundry On The Main Floor. 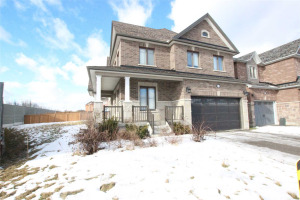 Short Walk To Neighborhood Park, Easy Access To Hwy 400/27/50 For The Commuters.